I have received numerous emails asking about silver. This article was prompted by a question enquiring what the silver price might be if my gold forecast of $4,500 proved to be correct. As I own some silver bullion and a number of silver mining shares, the question caused me to pause and take a closer look at silver. "In past crises, the wealthy protected themselves by purchasing gold and gold related assets. Ordinary people, by far the greater number, could rarely afford to buy gold. Being far cheaper, they previously had to buy silver. This metal became the poor man's choice as an asset to protect their savings. Silver has so far lagged gold in the early stages of this bull market, but that situation seems about to change." "Throughout recorded history the average relationship between silver and gold has been 15oz silver to 1oz gold. The ratio at present is a far higher 75:1 ($400/$5.30). This is massively out of line. If gold were to double to $800 per oz, it would not be unreasonable to expect the silver/gold ratio to decline sharply, possibly as low as 40:1. With gold at $800, this would position silver at $20. The above graph of the price of silver has been borrowed from an excellent recent article by Dan Norcini entitled "A Technical Look at Silver - Update". 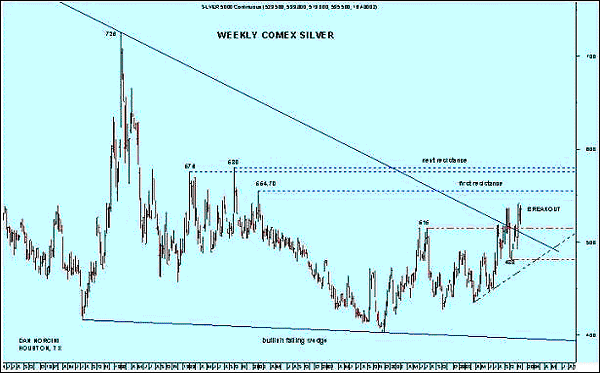 What is quite clear from the graph is that silver's 22-year bear market down trend has come to an end. As Dan Norcini says, a new bull market in silver has been born. It is difficult to argue against this contention and I have no intention of doing so. A silver price above $6.80 would complete a fabulous head-and-shoulders base formation. With this as a foundation, it would be possible to project a very large rise in the price of silver for the future." - end of the December 2003 quotation. 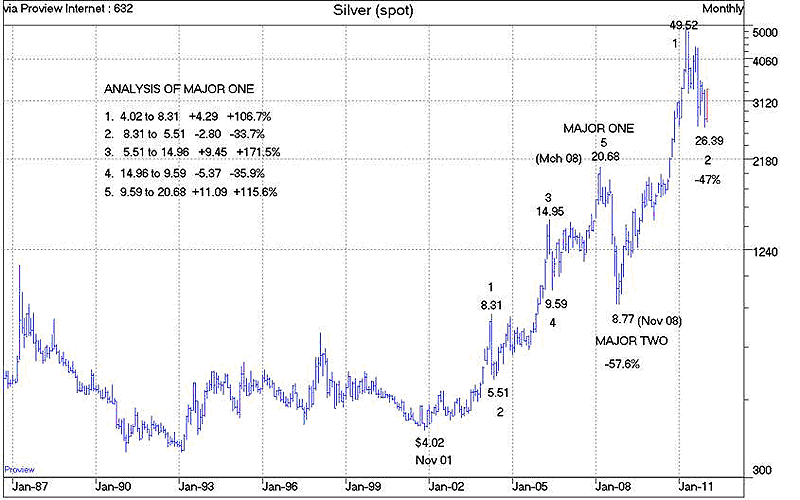 Silver did reach $20.68 in March 2008 at the same time that gold peaked at $1003. The silver to gold ratio was thus 48.5 in March 2008. The lowest this ratio has reached is about 32, achieved at the end of April 2011 when gold was around $1570 and silver peaked in the $49 area. At that point gold had experienced a 6-fold increase from its bull market starting point of $255 while the silver price rose 12-fold from its bull market starting point of $4 in November 2001. A further word of caution: silver is not for the faint hearted. Silver is considerably more volatile than gold and the corrections are much larger. Silver corrections can and do happen quickly. They are emotionally gut-wrenching and it is easy to get shaken out of one's position near the bottom of a large correction.